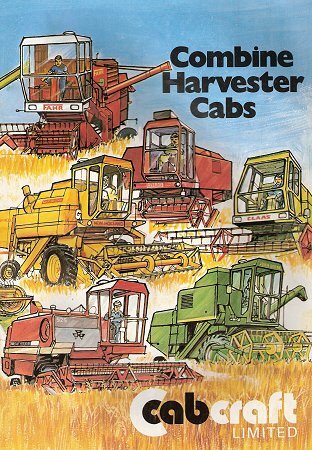 By 1970, our farm machinery dealers were starting to ask us to develop cabs for combine harvesters. Initially demand was to prevent drivers being catapulted into the auger should the reel dig into the soil, particularly when working downhill, often stopping the combine dead in its tracks. Surprisingly, working on a combine at night during the autumn could be quite cold especially with a wind blowing, farmers wanted a cab with a heater to keep them warm in these conditions. We sold a lot of cabs in N.E. Scotland, as up there they often harvest spring sown malting barley and oats in zero temperatures, in the late autumn/early winter often with snow on the ground. Drivers needed a warm working environment to avoid hypothermia setting in! This proved quite a challenge as the combines all had flimsy driving platforms and grain tank walls quite unsuitable for taking the extra weight of a half ton cab. 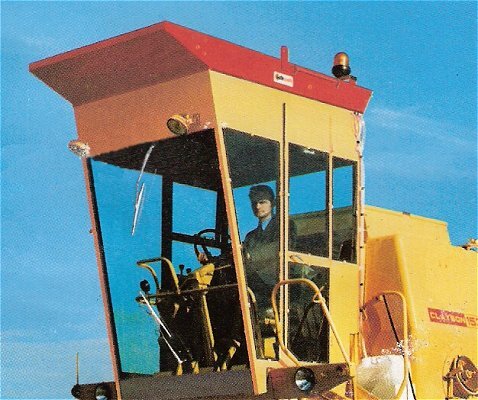 Nevertheless, we felt combine cabs could be a growth sector and commenced designing and developing cabs for most makes and models of combines, new and old. This required strengthening and sound/dust insulating the harvesters very substantially and the provision of detailed illustrated fitting instructions. At this time, I also recognised the need for specialist help in promoting this wonderful business opportunity to generate a very strong demand needed to cover our substantial development costs. My son John Barker was running a technical Marketing Consultancy company at the time and provided valuable guidance on providing potential market size, export opportunities and effective sales promotion. His team also produced some very effective brochures. 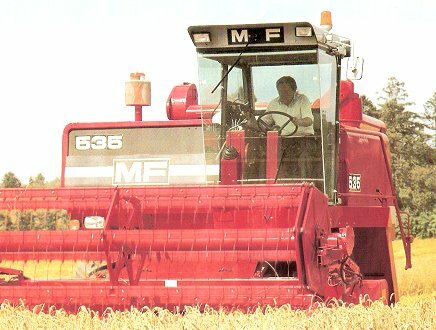 We advertised the product heavily in the farming press and sales soon took off in a substantial way, after two years we had over 30 cab variations to suit most combine harvesters. Export enquiries were received and distribution networks formed in several North European countries. We soon received demands for improved visibility to the ends of the cutting reel. My earlier work in steel rolling mills enabled me to develop intricate section cold rolled tube to enable very slim corner glazing pillars to be utilised. This improved the annoying blindspot areas down from 26cms to just under 4cms. The safety glass windows were glued into the rolled-in glazing indents on the vertical tubes eliminating sheet metal cladding and rubber glazing mounts, a huge and very popular step forward for our customers. The investment in the rolls to form these unusual patented section tubes was very substantial but was soon recovered as demand for the new 'full vision' cabs took off. 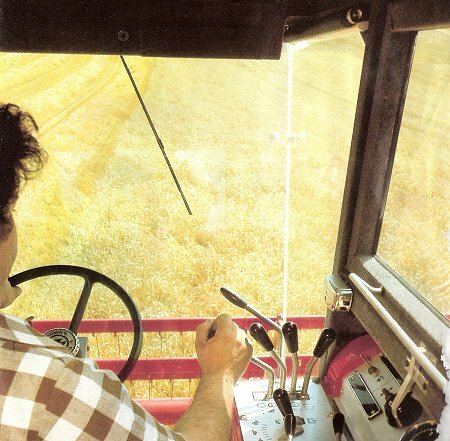 As time progressed, we produced a more advanced design with the first glass to glass front corner joints for Massey Ferguson and New Holland combines to reduce the blind spot to only 1cm. High strength adhesives held together three very large sheets of toughened or laminated glass, with only four small brackets at the top and bottom to provide back-up security. This technology is still in use today, 30 years on. Now they even use curved corners to provide zero blind spots! In the early 70's, Sheffield Hospital's Dr. Darke, a consultant specialising in industrial respiratory diseases, was becoming increasingly concerned by the poor lung condition of many retired farmers and farm workers. 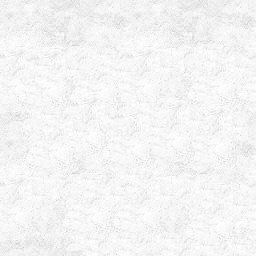 He discovered that tiny microscopic fungal spores often present on maturing cereal crops in damp weather conditions were being inhaled by combine harvester drivers at harvest time. He had noted our advertising campaign for combine cabs in 'Farmer's Weekly' and wanted to know if we could develop combine cabs with air conditioning systems capable of preventing these spores being sucked into the cab. Commercial air conditioning units were unsuitable for off road vehicles at the time, so we worked with our cooling fan supplier Temperate Filtration to develop a cab roof mounted unit with filters which would prevent spores down to 1 micron from entering. 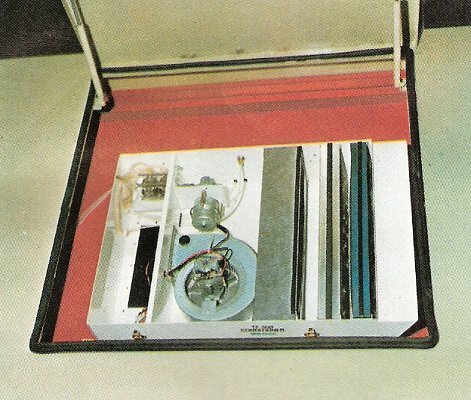 Within 6-months an electrically powered forced air cab ventilator with a combination of water mist chambers and filters was developed to supply cool cleaned air to the operator. Dr. Darke was very pleased with the test results and agreed to promote the health improvement benefits of the product in the farming press to overcome this major health hazard for those involved with cereal growing. He sent out an educational press release and we ran a series oh half page advertisements in 'Farmers Weekly'. Our marketing Consultants succeeded in persuading the TV farming programme to feature this development. We had a full half hour programme made by Tyne Tees Television who then syndicated it to all the Sunday Farming programmes in other ITV regions. Dr Darke was interviewed, and I gave interviews sat on top of one of our combine cabs. As a result, the business grew strongly and expanded to eventually generate some two thirds of our income. All our cabs had our distinctive orange and black logo on each side of the roof panel, and Doug Barker (soon to be known as Mr. Cab-Craft) recalls many emotive meetings at agricultural shows with farmer's wives who had lost their husband to harvest lung and who wanted a cab to prevent their sons from running the risk of a similar early death. Later on, activated carbon filters were introduced to provide even greater protection from breathing-in chemical mist for self-propelled sprayer operators. Enclosed helmets complete with battery powered fans and filters were also developed by competitors for combines and sprayers, but proved unpopular with drivers due to their weight. A close-up view of the Sperry New Holland 1500 series cab, clearly illustrating the ultra-slim corner pillars and the double-skinned roof arrangement. 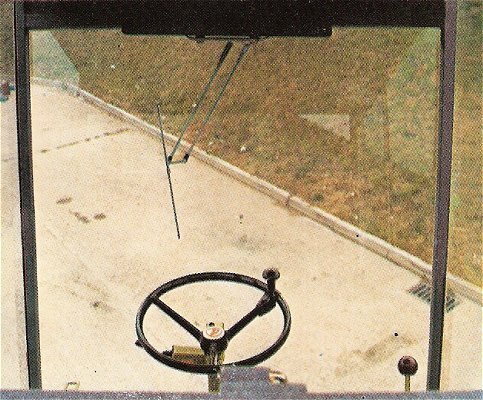 A view from inside the cab, taken from the rear window, indicating the panoramic visibility afforded by the method of glass fixation. This view from the driving seat (impractical to photograph), gives uninterrupted visibility of reel and auger. The view from on top of the cab roof illustrating the TF300 air filter/cooler installed in the roof space of the de-luxe cab. The access hatch is gas spring assisted for easy opening and closure. This photograph shows a practical demonstration of the purpose of the two-part ‘stable’ type door. 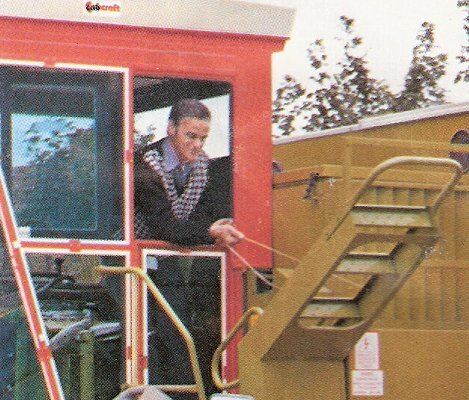 The driver is shown lowering the raised footsteps to enable him to leave the combine. The alternative is a sliding door which may not provide an adequate dust seal.